My job has many perks. Great transportation benefits, onsite credit union, good healthcare coverage. I’m lucky, I know. Those take a backseat to one particular function of my job: I plan private dinners. Over the past few years, this particular perk has taken me to Poste Moderne Brasserie, Acadiana, Bistro D’Oc, Fiola, Art and Soul, Bistro Bis, Zola, and Rasika. Our latest venture was one of the most luxurious meals that I have ever organized—a four-course meal at Co. Co. Sala. If you plan a private function at Co. Co. Sala, prepare to be seated in a quiet side room with gold and chocolate brown walls, swaths of red velvet, low Victorian couches, and heavy slate tables. The darkened, romantic room would be a perfect spot for a bachelorette party or intimate cocktail soirée. It was a bit of a departure from our normal business gathering, but it was really lovely. 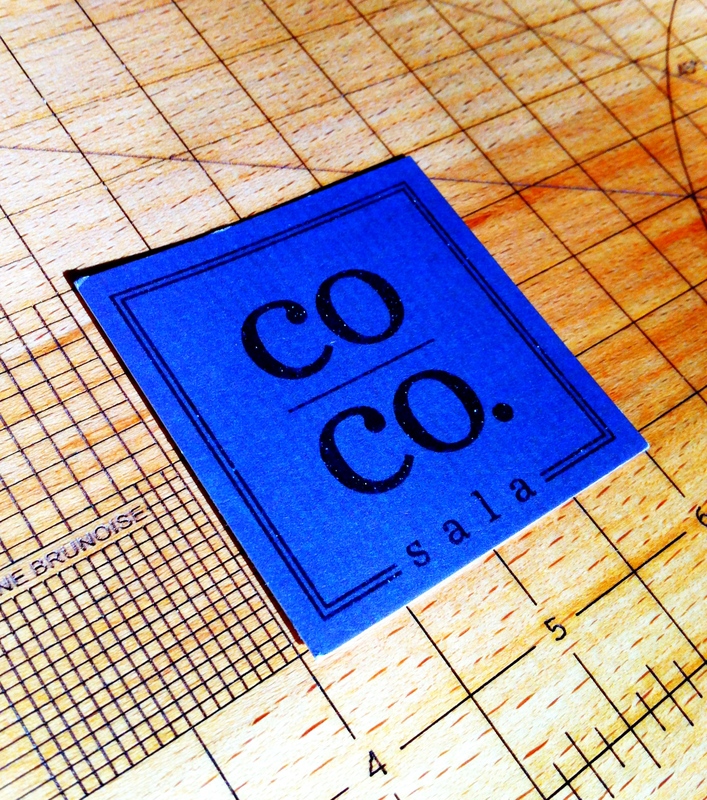 Now for a warning: the Co. Co. Sala menu may induce fits of giddiness and child-like glee. As suggested by its name, this boutique restaurant incorporates chocolate into almost every dish, whether in a cocoa bean crust on the steak or a mocha hazelnut dressing coating a delicate salad. It’s very decadent, rich, and inventive food, but for someone with allergies, the menu does require some caution. As I was planning for this event, I made it very clear that peanuts could not come in contact with any of our food, and that it was important that this be made known to all staff involved. A few of my guests also had dietary restrictions. One, a vegetarian, received a lovely artichoke tart, and a mushroom risotto in place of the regular fixed menu. The more challenging restriction was a guest’s allergy to the allium family. For those of you who aren’t versed in peculiar gastronomic classifications, the allium family contains onions, garlic, chives and leeks. This can be extremely dangerous; many dishes contain these ingredients but they wouldn’t necessarily be listed on a menu! Luckily, I knew about the allergy in advance, and the staff were able to prepare safe, allium-free dishes that looked absolutely extraordinary! Safety precautions set, it was time to eat. The meal started with a manchego and baby arugula salad with caramelized walnuts, dates, apples, and oranges with a hazelnut and coffee dressing. I wasn’t too crazy about the salad, but I seemed to be the only one—everyone around me was scarfing it down! I commend the portion size though; it was a light and refreshing start to the meal. 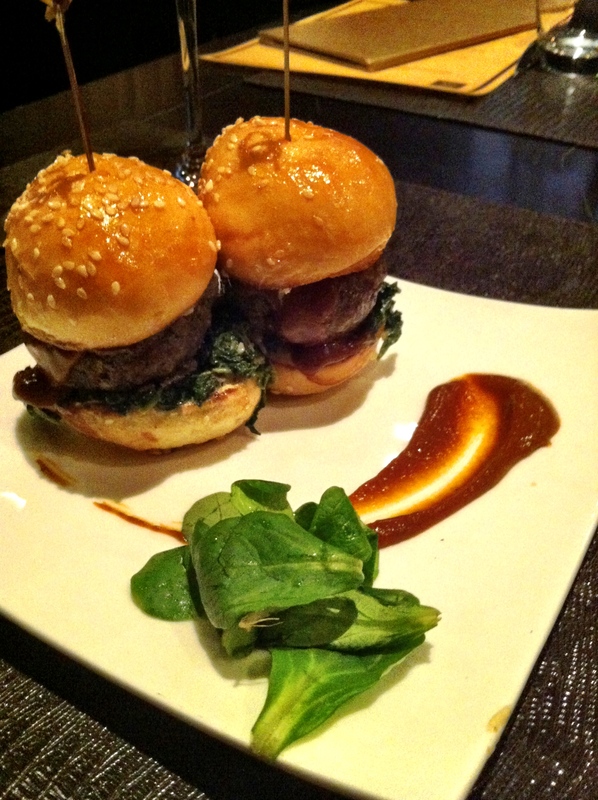 Next came the blue cheese beef sliders with mole sauce, sautéed spinach, and wild mushrooms. Although sliders often get a bad rap, these specimens were superb and ungodly rich. I may seriously rethink my previous praise of Ray’s Hellburgers as the best burgers in DC. Co. Co. Sala, with their meticulous choices of seasonings and interesting accompaniments, could give Ray a run for his money any day. The third course literally blew me away. Set before us were two perfect crabcakes with mango salsa, chipotle chocolate tomato glaze, and an avocado cilantro emulsion on the side. 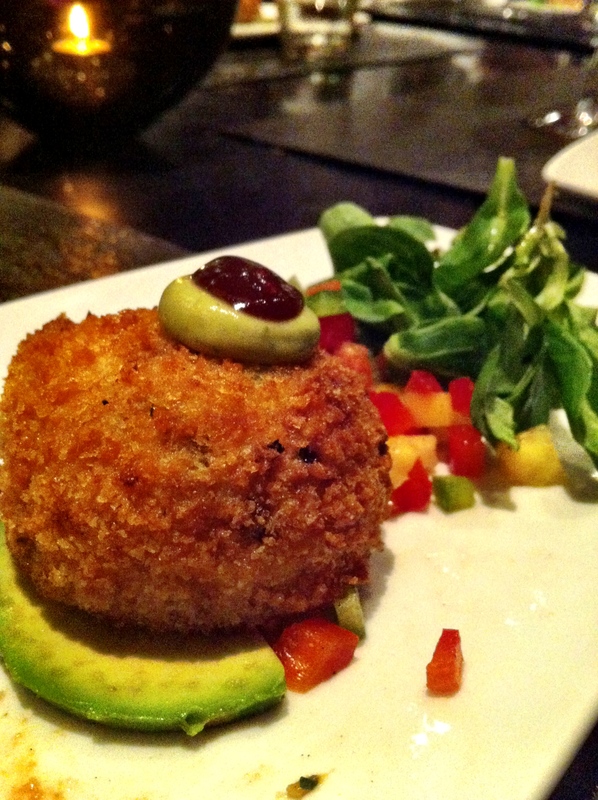 The crab cakes were so perfectly creamy and flavorful, with a crispy batter that never bordered on greasy. Add in those crazy chocolate-tomato-cilantro combinations, and you have an astounding plate of food. Now. Can I have a drum-roll please? It’s dessert time. And you know it’s gonna be good. 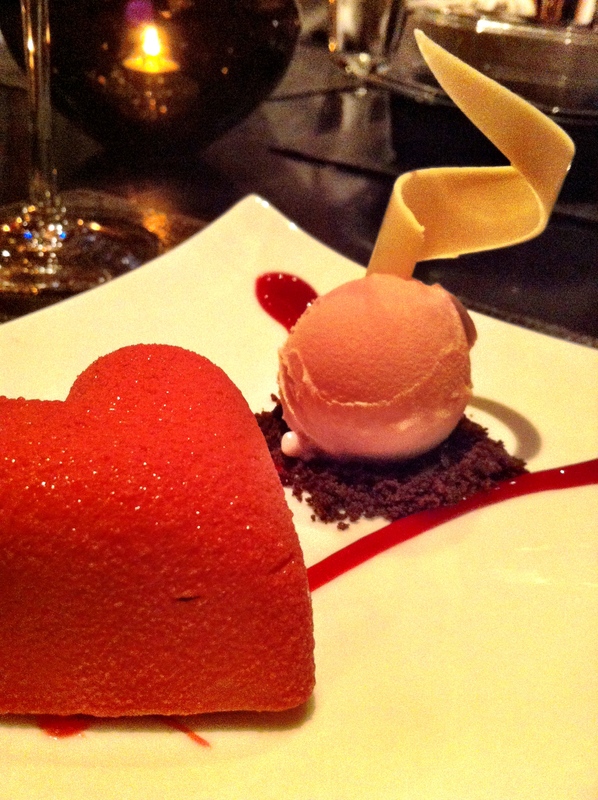 I’d like to tell you a bit about dish called “A Raspberry Affair.” Its delightfully glittering, hot-pink heart-shaped shell belies the sinfully rich, creamy center of the mousse. Every bite includes a pop of crispy chocolate pearls embedded in the fluff. Then, you take a spoonful of the tart, bright sorbet, and can almost taste the champagne bubbles tickling your throat. The artful swirls of chocolate with the dish are more than mere adornment—they’re the rich farewell kiss to this brief, but passionate affair. Ah! But, wait! You thought it was all over. Well, you thought wrong. It wouldn’t be Co. Co. Sala without a final parade of chocolate. 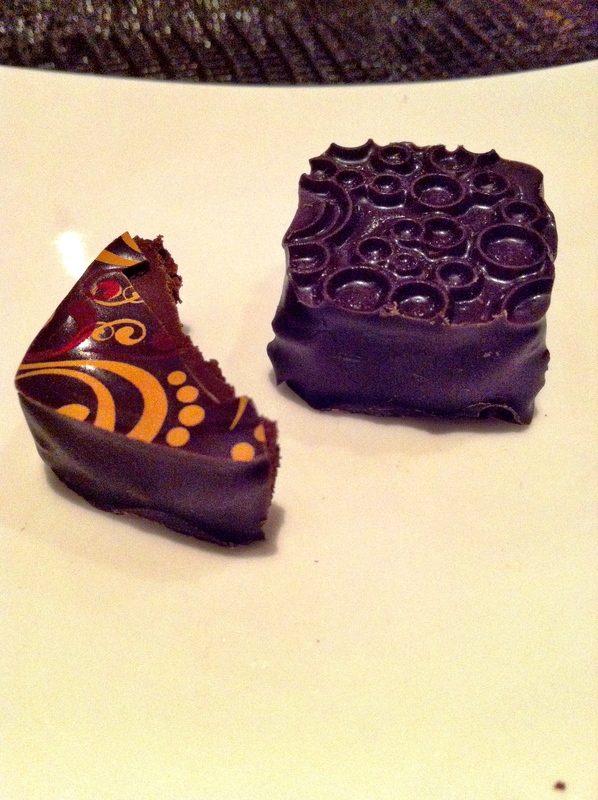 Two petit fours arrived—one, a rich but simple 70% dark chocolate truffle, and the other, a mojito-flavored pillow of chocolate with a bubble pattern making craters on the surface. As you can tell from the picture, I was so hasty to try the gorgeous chocolate, that I took a bite before I remembered to whip out my trusty camera! All in all, this was an extremely delicious and enjoyable meal at Co. Co. Sala. 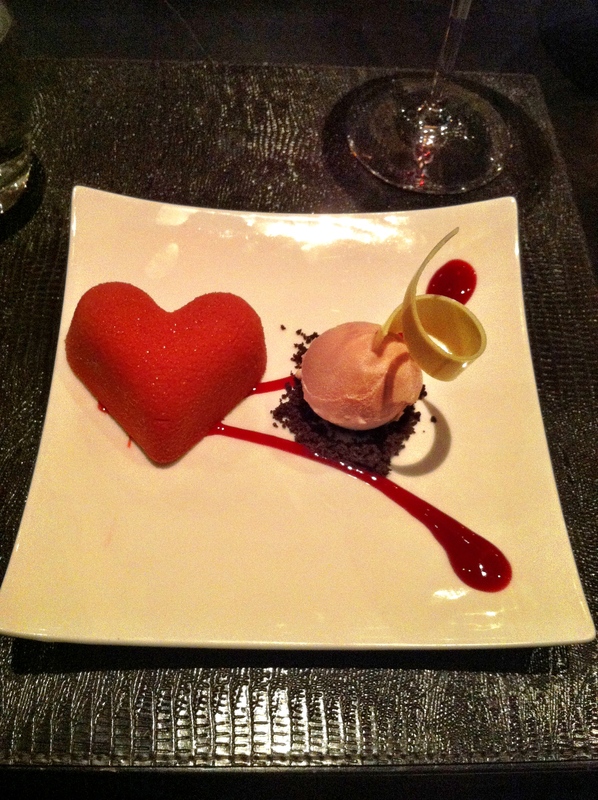 They took great care of us, and were responsive and accommodating to the various dietary restrictions that I presented. I realize that most of my readers don’t have the luxury of executing a dinner contract that includes directives about allergies and other restrictions. But their willingness and ability to accommodate those requests suggests that Co. Co. Sala can be a safe environment for those with restrictions. Because the menu incorporates unexpected elements, I would suggest calling ahead and discussing your needs with the chef. But whatever you do, prepare yourself for a truly delicious meal.